Sunday morning, coffee mug within reach, screen across my dancing fingers on the keyboard, and a smile upon my face, despite the fact that one hour has been stolen from my night’s sleep. I guess it’s officially spring, but I’m not high on flowers and balmier days – I’m high on translation and on working with colleagues. 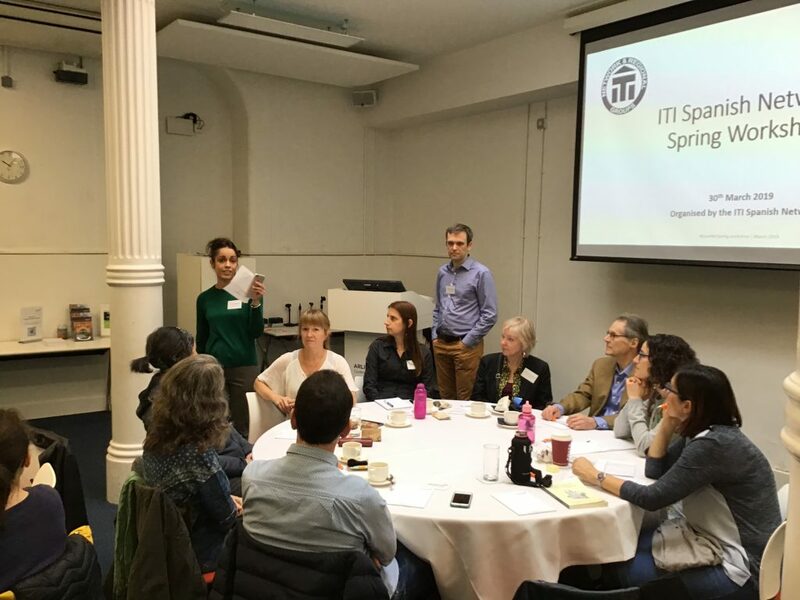 I spent my Saturday polishing my CPD at the ITI Spanish Network’s spring workshop together with almost 40 other translators, and what a day it was! I always jump at the opportunity to attend events to catch up with old colleagues and meet new ones, but I’m a bit tired of sitting and listening to presentations. I need more action! And that’s what I was hoping for when I signed up for this event. By the time I came back home in the evening, my disappointment meter was at 0.0. Hosts Richard Lackey and Lisa Agostini. Photo credits: @ClaireSelden. Most of us mousy freelance translators work from the solitude of our home offices, leafing dictionaries (literally for some, symbolically for those whose resources are mostly on the infinite cloud up there), hesitating, deleting, typing away, stomaching failures alone and celebrating victories the same way. The echo of our unanswered questions bounce on the four walls and hit us back with no mercy. Yes, we talk to ourselves (right? ), at least I do, and I mean out loud. Were someone to watch me on a given day at my desk, they would hear things like “Is this really the best word I come come up with?, Do I need a comma here?, Is this the source text crawling into my translation or is it actually Spanish?”. And the answer? The wind outside my window, my cat moaning in dreams, music playing in the background, crickets. Yesterday, however, I got real answers from other humans, or superhumans, actually, because they were all translators. I co-work with colleagues once a month, which allows for some collaboration, but for a while now I have been toying with the idea of something more defined. 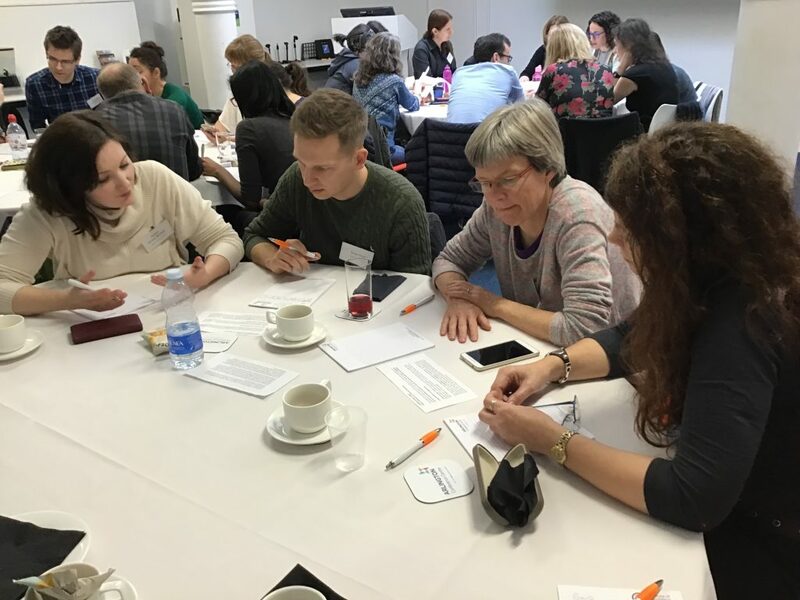 I’d like to work more closely with other translators – organising bi-monthly sessions to check each other’s work, meeting to discuss the pitfalls we stumble upon once and again, or sharing specific difficulties we have written down while working on an assignment. We all know two pairs of eyes are better than one, but I wanted to take it a step further, not just proofreading someone else’s work. A colleague and I discussed it months ago, but we always ended up putting it off. Yesterday, I found the inspiration I was missing to give this project a push. In the few exercises we did together, I realised more than ever how invaluable feedback from colleagues can be. 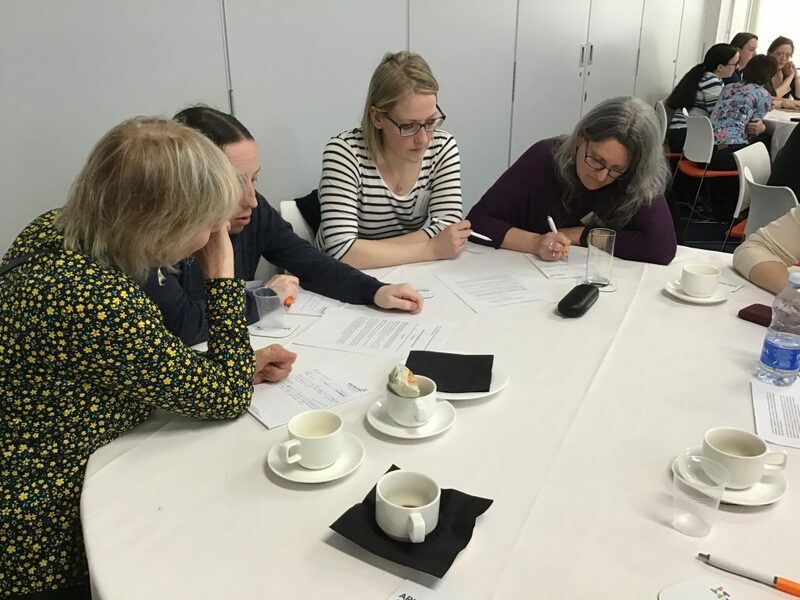 The first translation piece we worked on in a four-person group was a short questionnaire for caregivers, something you would probably find on the NHS website or at a surgery. Four Spanish speakers, three different countries, one mission – the perfect translation. 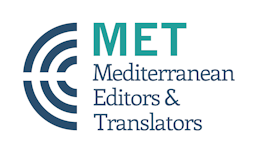 Rather than co-translating from the beginning, we worked on the piece individually asking a few questions here and there and, at the end, we started to read our translations out loud and analysing them. We had to agree on the level of formality (tú vs usted), come up with a solution to make it gender-neutral (we assumed most readers would be female, so we were reluctant to use the generic masculine), negotiate how much repetition Spanish allows as opposed to English, and so on. This exercise happens in our home offices all the time, only the voices we hear are our own. 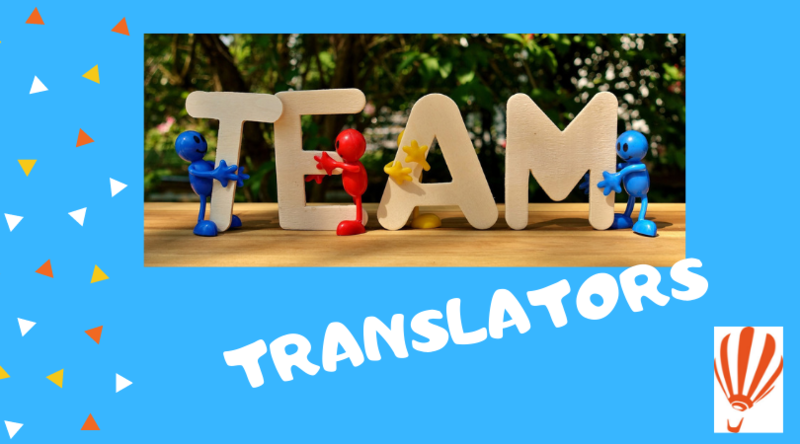 Having three more minds to bounce ideas off resulted in a high-quality translation, something we do accomplish on a daily basis, of course, but with colleagues, it takes less time, less re-reading, less thinking in circles, and, needless to say, it’s more fun! On the other hand, collaborating with colleagues working in the opposite language pair turned out to be incredibly enriching as well. Can you imagine having someone nearby with whom you can deconstruct the nuances of a phrase or specific word from the source text? That would certainly save research time and be beneficial for both parties by looking at how English and Spanish compare. We saw this very clearly during the translation slam. The brave colleagues who volunteered their work so we could take it apart and analyse every bit could find new nuances of the source text by asking native speakers right then and there. Again, invaluable insights. One example we all loved was the phrase “Me and the wife”, part of a man’s statement in a satirical newspaper article. Both the word order and the use of ‘the’ instead of ‘my’ denote a certain macho attitude, and given the overall context of the article, we agreed the speaker wasn’t necessarily the academic type, so to speak. Both participants opted for ‘Mi mujer y yo’, but a room full of linguists couldn’t just let it go. We questioned whether this neutral rendering really conveyed the nuances present in the original. Why not translating it as ‘Yo y mi parienta’? At least in Spain, ‘parienta’ is a macho term for ‘wife’, one that women don’t appreciate. We feasted on this for a few minutes, because that’s what translators do – we feast on language and dig into the deepest subways of cultures. And we love it! 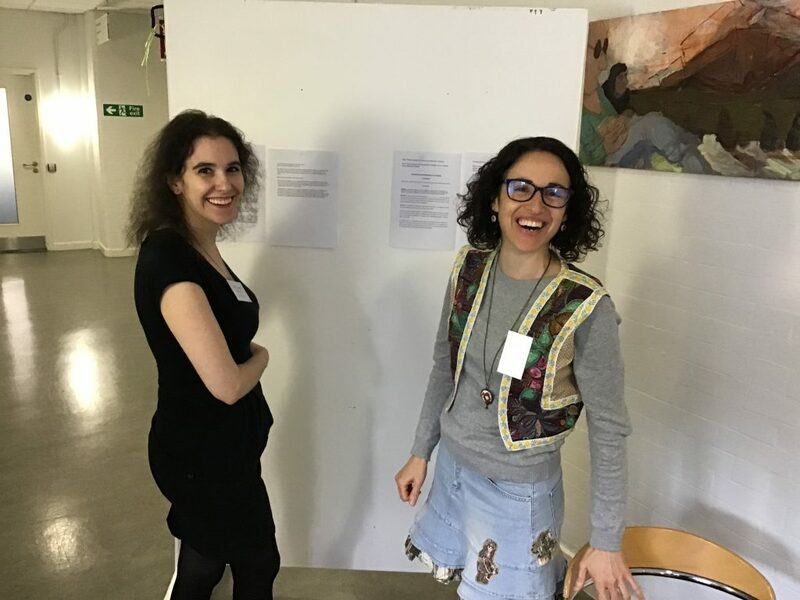 And because translators do not live on words alone, we rounded up the day feasting on some delicious Greek food and sharing funny anecdotes about living both abroad and at home. Boredom is never a risk one takes when dining with other linguists. My conclusion? Working closely with colleagues who share your language pairs, in both directions, is incredibly enriching. The final result is better, yes, but what I find most important is that it shines a light where darkness usually dwells – yesterday I confirmed once again that I am not alone, even in the gloomiest day in my home office. Somewhere near or far there’s someone checking for the umpteenth time if rioja needs to be capitalised in a particular sentence (just to be 150 per cent sure), frantically flipping through the pages of a collocations dictionary to find the perfect adjective to make that product pitch shine, and sending WhatsApp messages to a colleague so they can reassure their decision on a given sentence. No more postponing. 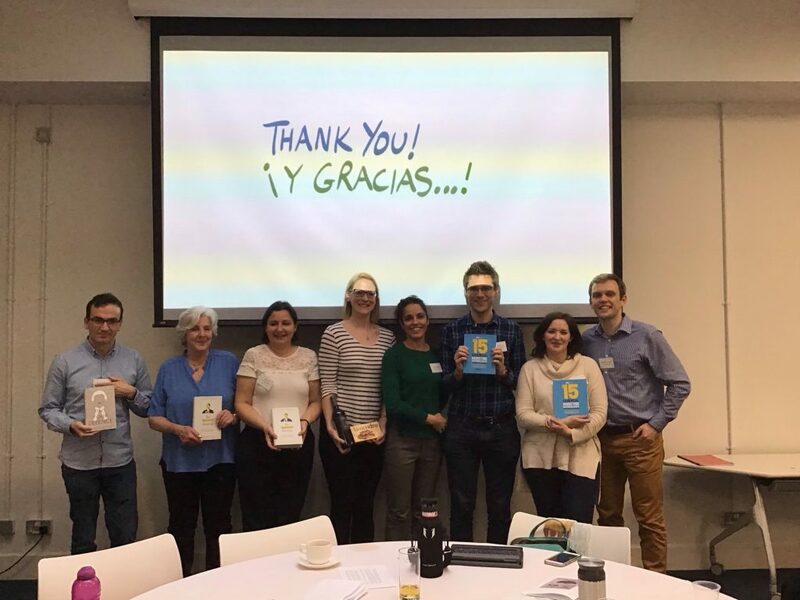 Translators, get together, drink coffee, check each other’s work, learn about other variants of your own language, agree (or disagree) on the best options, share your resources and tricks, help one another shine through your work! Who would like to join me for co-translation? Great post, Carolina! It sounds a really interesting event. I’m a member of the network and I’ll have to get along to one of these at some point. The kind of translator collaboration and mutural revision you’re suggesting really does work. Tim Gutteridge, Victoria Patience and I have been doing it for some time in something we call RevClub. I don’t know if you’re coming to the ITI conference, but Victoria and I will be giving a presentation on it there. I’ve heard about the wonderful RevClub, of course! I did for the first time at the MET meeting in Girona and again last Saturday at the event. I won’t make it to the ITI conference this year, but I’d love to hear your presentation.